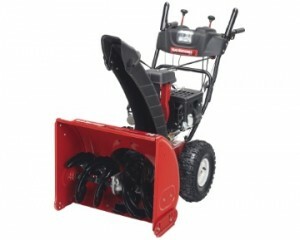 Description: The Yard Machines MTD 31ABS62EE500 2 Stage 24-Inch Snow Thrower is a basic 24 inch wide snow clearing machine. It is suitable for most consumer needs with the standard driveway. This machine is also relatively small compared to many other machines and easily be stored inside your garage. It has the standard 6 forward speeds, side crank chute control, powered light and electric or manual start capability. 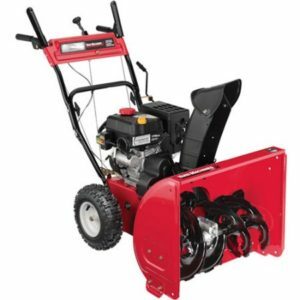 There are no customer reviews for the Yard Machines MTD 31ABS62EE500 2 Stage 24-Inch Snow Thrower at the time of preparing this review. We will update this review in a few months time to add summaries of any future reviews. If you have purchased this machine and would like to leave a review for our readers, please do so. 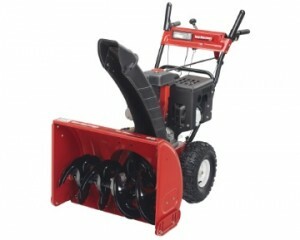 Description: The Yard Machines MTD 31AH54TG500 2 Stage 28-Inch Snow Thrower is a new machine offered for sale. There are no reviews as of yet. It is a 28 inch wide machine which is a middle of the width machine. It has 4 way chute control. This snow blower also is steerable with the click of a trigger. It also comes with a chute that will not rust. Electric start is also included. 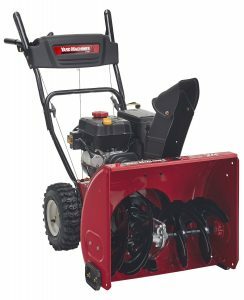 There were no reviews available at the time of preparing this review for the Yard Machines MTD 31AH54TG500 2 Stage 28-Inch Snow Thrower. 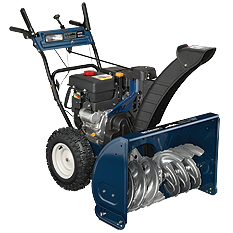 If you have purchased this snow thrower please leave comments regarding your impressions of the machine and it’s suitability for consumers. We will update this post in a few months. 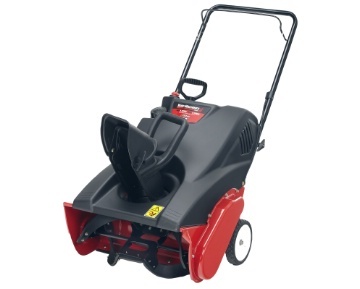 The Yard Machine Snow Thrower model H63Ke comes with a 24 inch clearing width suitable for most consumers needs. This snow thrower is 2 inches wider than the smallest blowers and yet is small enough to be stored easily in your garage. It comes with space saving folding handles, an in dash yard light, and electric start with a manual backup. Electric start is handy for people who do not like the manual pull chord. We did not see any reviews for this particular machine. We would welcome readers comments about their experience with this model. This model also allows the operator to steer the machine with a single hand. They can operate the chute with the other hand. This is a great feature especially when you need to navigate around parked cars and side buildings. Read on for the full list of specifications and features. 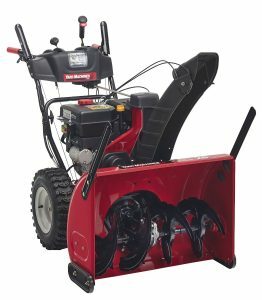 The Yard Machine Snow Thrower has a 28inch clearing width with a 277 cc engine that will deliver all the power you need to clear snow from your driveway and sidewalk. It has the standard six forward and 2 reverse gears to allow you to change speeds to meet demand, the weight of the snow and the depth of the snow. The intake height is 21 inches and you have 16 inch tires with heavy tread to give you lots of traction. 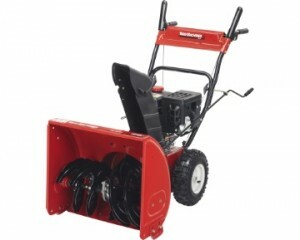 This snow thrower also comes with an electric start or a manual pull chord start. Both are set to make your life easy in cold conditions. There is also a steering switch which allows you at the press of a button to change direction avoiding the need to try and manhandle the machine while clearing snow. The handles also fold down making it easier to store your snow blower when not in use in tight spaces in your garage or outdoor shed. It also comes with single hand controls allowing you to adjust the chute while blowing snow. For more information refer to the specifications and features below. 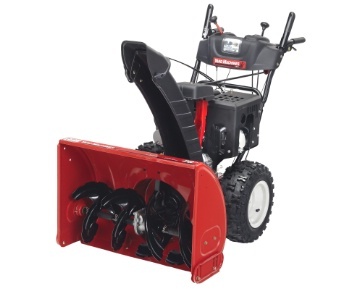 6 Forward, 2 Reverse Speeds: operate the snow thrower to match the conditions. Transmission: This snow thrower has 6 Forward, 2 Reverse Speeds: operate the snow thrower to match the conditions. Most snow blowers can be purchased with tire chains to provide extra traction in icy situations. In addition, snow shields are also a good idea. Especially if you want to protect yourself from windy conditions and snow being blown back at you from the wind. A snow blower is a powerful machine and should be treated with safety in mind. Carefully read all of the safety guidelines in the manual prior to operating the machine for the first time. Also follow these guidelines to ensure that both you and the machine do not have an accident. 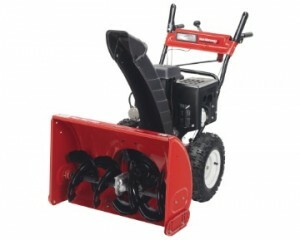 The Yard Machine Snow Thrower H64FG comes with a standard transmission and 28 inch clearing width which is more than suitable for most urban situations. If you need to clear your driveway and perhaps the sidewalk, this snow blower will make quick work of just about all snow conditions. The engine is 277cc and 4 cycle which is more than powerful enough to drive the augers and blower through heavy snow. Some of the features that consumers will appreciate this snow thrower comes with include: Electric & manual start; In-dash yard light: improves low visibility; Space saving, folding handles for easy storage; and assembles in minutes. For more information about specifications and features, read below. We also have a section on maintenance and safety related issues later in this post. – This is the really important part. You have plugged the augers with snow, you have shut the machine off and now you are trying to clear the snow away. Never place your hands inside the augers to get at the snow. Use a broom handle if you have an old machine, or the snow clearing tool that came with your newer machine to clear the snow. You can also purchase these tools from most stores as an extra if you break yours or if you have an older machine which does not have one. This is the safe way to clear snow from around the augers and the impeller.